The Original Change Mate was born after we had identified a "serious" problem that needed fixing. After years of living in Manly Beach - Australia and seeing numerous people struggling to get changed at the beach we thought that something needed to be done. In all honesty it all started out as a a bit of fun and a joke at the same time. It's amazing what can come up when you put a bunch of funny people together. As it turns out the "just joking" mood started to fade and the real brain storming started to emerge. All of a sudden we were really on a mission to help people and facilitate the dreaded getting changed in public without showing parts of their bodies that they wanted to keep private. We came up with all sorts of devices, some good and some definitely not so good but at the end we got there. After more than 1 year from when we toyed with the idea the Change Mate was born. During our research we did find that there were a few products out in the market that can be used to get changed at the beach but there was nothing quite like the Change Mate. We finalised the design and found a local manufacturer right here on Sydney's Nothern Beaches. 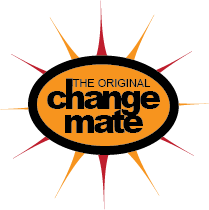 As the Change Mate was born right here in Manly Beach we thought that it would have been the perfect fit to launch it during the magnificient Manly Beach Jazz Festival. We were there for 3 consecutive days and did more than 100 demonstrations of how the Change Mate works. We were overwhelmed by the positive feedback. Yet we had the feeling that we were not quite there yet!! We were still after more features. We had this dream of making it out of terry towelling material so that people could use it to dry themselves after a swim.... so.... here we were once again back at the drawing board!! In the meantime we also had to make the decision to change manufacturer as it was a little tricky to work with a company that simply couldn't see our vision. In their eyes we had this outlandish/borderline silly idea and in our eyes we simply were on a mission to make our project even better. After much research and some good old sweat blood and tears we managed to find a great manufacturer who understood our vision and contributed greatly in realizing the final product. Well, now we need to know what the general public thinks of it and what better way to put it out to the world than embarking on a Crowd Funding campaign. We have decided to launch our Change Mate on Kickstarter and will need all the support we can get to finally get into proper production. Keep an eye out for the campaign and please support us. Yes, we're boldly asking for your support and we're also asking you to share the project with your friends and families. 2 Mumpreneurs with a vision! !